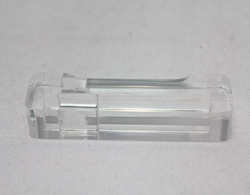 Many applications benefit from using clear machined parts to help view the process or improve aesthetics. Including automotive lighting and lamps, lightpipes and displays all require good optical components characteristics. 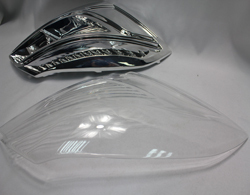 Acrylic machining and Vacuum casting techniques can produce clear prototype. Factors that determine the optimal solution include the degree of clarity required, part complexity, quantity and timescales.Acrylic polishing requires the removal of material and it is essential to achieve a good machined finish before polishing to ensure critical dimensions can be maintained. Manual polishing requires different grades of polishing process used in conjunction with polishing paste which will remove surface material and leave high quality polished finish on CNC acrylic and other plastics.Jevny employs skilled craftsman with many years of experience in this highly specialized process. Vapor polishing is ideally suited to the polishing polycarbonate of small features and offers improvements to internal and external surface finishes. Minor scratches and other small surface irregularities can be removed from machining polycarbonate parts by vapor polishing. The process is performed with a chemical vapor, which attacks the surface of the plastic and smoothes it. When done properly, vapor polishing can provide optical quality finishes.